Sue is a Supply teacher working across Sussex and Surrey. Sue found that many children had never been on a bus let alone a ‘Playbus’ and they wanted to know more, so she decided to write a fictional tale about a ‘Playbus’. ‘Jay-Jay the Supersonic Bus’ came out in print in 2014. From Fact to fiction the bus journey has continued with three more bus related stories as well as a few tales about being a teacher. 'A Spooky Tale' and 'The Christmas Play Rehearsal' are a teachers tale. It’s that time of year. The children are excited about Christmas and, in some schools, they are learning the true meaning of Christmas. Many teachers are busy preparing the young people to put on plays and special events to entertain the parents. A Nativity play helps one group of children learn about the birth of Jesus. But, they do it in their own special way with their own unique qualities shining through. One of the angels suggests that Mary and Joseph take the bus to Bethlehem and the star that leads the wise men to the manger is dressed like a rock star superstar. And this superstar manages to lead the wise men all over the auditorium, almost running them into the Christmas tree. It doesn’t matter if the production isn't perfect. The parents will love it, just because their young people are performing. And the children will have fun, even if they forget their lines once in a while. The important thing is the lesson they learn about the true meaning of Christmas. 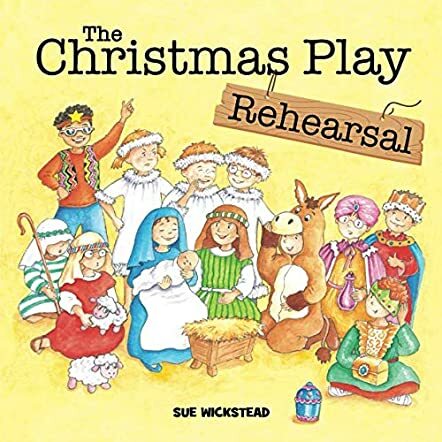 Sue Wickstead’s picture book story, The Christmas Play Rehearsal, is full of light-hearted humor and good fun. With colorful illustrations and a genuine passion for the beauty of what children can do, the author presents us with a fun look at the behind-the-scenes drama of a school production. It’s all in good fun and the message is not just the story of Jesus’ birth, but also the camaraderie of the children and the dedication of the teacher that bring this all together. For better or worse, it’s a big day for children, parents and teachers alike. This would be a good story to share with a young reader who’s nervous about opening night of his or her Christmas play. It would also allow children to laugh, not only at the ingenuity of the children in the story, but also at some of the funny things that might occur in their own school production.